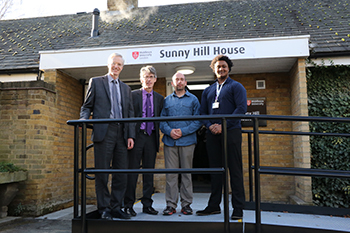 A brand new Wellbeing Services centre in the heart of Middlesex University’s London campus has been opened by Vice-Chancellor Professor Tim Blackman. Sunny Hill House brings together the whole of the University’s wellbeing team in a dedicated space featuring private consultation rooms, disabled parking and access, and a secluded garden. The Disability and Dyslexia Support and Counselling and Mental Health teams will use it as a base to help dyslexic students facing challenges with their studies, provide emotional and psychological support to those in need of counselling, and assist disabled students in maximising their university experience. More than 900 students have been recorded as having used Middlesex’s Disability and Dyslexia Service and it is hoped that the new centre will enable the University reach many more, including international and EU students. “For a long time our Wellbeing Service was split across different parts of the campus, but it has now all been brought together, for the benefit of all of our students,” commented Professor Blackman. Student’s Union Vice-President Andre Thompson, who spoke at the launch, said: “The Wellbeing Services is increasingly important to the student body.